Happy Play Date Cafe Thursday! This week in the Cafe we have this beautiful picture for you to use as inspiration. Instead of creating a card with a flower as my focal image, I used this sweet new image from the Artistic Outpost Lovely Day plate. The collage image is stamped in Black Archival on Watercolor paper, then colored usign the Marker Watercoloring Technique, in Crushed Curry and Pixie Pink. I added Ranger Old Paper Distress ink the stamped panel to age it a bit, then mounted on a Black panel and distressed the edges. I found the perfect colors in this piece of Basic Grey Two Scoops Pattern Paper to match todays challenge. I added some Zva Creative Pearls to the Crown and bottom corner. Thanks so much for stopping by, we'd love for you to play along with this weeks challenge at The Play Date Cafe. You can find all the details here on The Play Date Cafe Blog. Beautiful work, Lisa....love the image and what you did with it this week....great use of the colors too! Lisa, Wonderful vintage card! The pearl flourish adds such a wonderful accent! Great sample of this week's colors! Beautiful splashes of colors on the image and the flourishes from pearls are a fab touch! Beautiful use of the colors! Love the new images! Gorgeous vintage creation, Lisa!! That image is just wonderful and I love your pearl flourishes!! This really turned out pretty, luv the pearl flourish! This is so beautiful, Lisa - like an old-time tinted photo in a scrapbook. Love it! Lisa--this is beautiful! LOVE those pearls and the image! Great job all around:) You def. inspired me!!! Beautiful card..I too like the pearls. I love your design! It screams vintage! You main stamp is amazing and you worked the colors perfectly! Thanks for some great inspiration! I love how you combined the color challenge with this beautiful images ... the shading on her dress is wonderful & I love the pearls. Love the pearls on that card too! oooohhhhhh i just LOVE this card - beautiful! 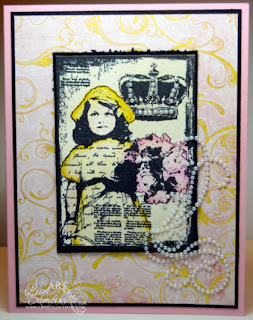 What a great image....love how you decorated it with those little swirly pearls. Great card!